Below are a variety of questions frequently asked about veterinary dental care and oral surgery services. If you have additional questions that aren't covered here, please feel free to give us a call at 920-233-8409 or 888-598-6684. We look forward to answering your questions about your pet's dental care. What are the Animal Dental Center's hours? We are in our Oshkosh facility Monday, Thursday and Friday 8-5 PM. We are in Glendale at Lakeshore Veterinary Specialists on Tuesdays, and in Greenfield at Milwaukee Emergency Center for Animals on Wednesdays. The Animal Dentistry and Oral Surgery Specialists, LLC. is closed on Saturday and Sunday. Please call 920-233-8409 or 888-598-6684 to schedule an appointment or contact us online. Do I need to have an appointment and how do I get there? Yes, consultations and procedures are scheduled by appointment for each location. You can find a list and maps of all Wisconsin and Minnesota area locations here. Do I need to take my pet to a veterinary dental specialist? It is an opportunity to have a board certified veterinary dentist available for your pet. Your veterinarian cannot be expected to be able to address every aspect of health care for your companions. The dental equipment, special supplies, extensive post graduate training and experience require tremendous time, effort and resources. Our "team approach" to vet dentistry and oral surgery allows us to work along side of your veterinarian and to complement their efforts and resources. This team effort allows for optimal patient care. Dr. Kressin has the training, equipment and experience to help your pet and compliment your family veterinarian's services. As a board certified veterinary dental specialist, Dr. Kressin will provide high value services for your pet. Dr. Kressin and his practice is entirely focused on veterinary dental and oral surgical needs for animals. He works closely with owners, their pets and primary care veterinarians to provide the highest level of veterinary dental care for your pet's condition or disease. He also enjoys speaking and teaching others about veterinary dentistry and pain management. Who will perform surgery on my pet? Dr. Kressin or another board certified veterinary dentist, will perform all oral surgery your pet may require. Dr. Kressin has a resident who is a DVM and they often work together on cases. If the resident will manage your pet's needs without Dr. Kressin, you will be informed. We are very happy to schedule your pet's appointment specifically with Dr. Kressin. What is the difference between a board certified veterinary dentist and someone in a residency, or one that has finished a residency? A board certified veterinary dentist has successfully passed a rigorous 3-day exam which includes the performance of surgical procedures. Board certification is required to be called a specialist according to the American Veterinary Medical Association, the governing body of the veterinary profession. Residency programs are designed to train individuals to complete the credential requirements. The resident must have their credentials evaluated and accepted by the American Veterinary Dental College, before they are allowed to take the certification exam. The resident may not call themselves a specialist or imply they are a specialist. Learn more about qualifications of a veterinary dental specialist. Cash, Check, Mastercard, Visa and CareCredit are accepted by the Animal Dental Center Milwaukee/Oshkosh. Yes, you can make payments using CareCredit. Payment is required at the time of service, however, we accept CareCredit, a service that arranges payment plans for you. This is a blood test performed at your veterinarian's office or at ours, the morning of the scheduled procedure, prior to surgery. It tests the organ functions, blood counts and clotting function of your pet. The pre-anesthetic blood screening is done to help assure safety during surgery, and the ability to heal following surgery. Will my pet be in pain after the procedure(s)? 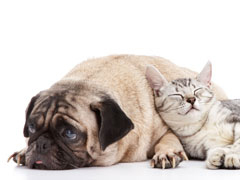 We employ balanced anesthesia to minimize or avoid discomfort for your pet. Dr. Kressin has a passion for pain management. In most cases, your pet will recover rapidly and return to normal activity within 1-3 days. Please be sure to follow our written instructions when your pet returns home. Absorbable sutures are typically used in oral surgery. These sutures remain visable for two to three weeks, and subsequently dissolve or resorb. In some surgeries for patients with cancer, non-absorbable sutures may be used. In these cases, the sutures are removed 14 days following the surgery. What should I do to protect my pets dental and oral health? It is very important to be your pet's best advocate. You are the most important part of the team. Regular teeth brushing is needed for many reasons. Teeth brushing allows you to help prevent periodontal disease and to recognize potential problems. Pets count on you to get help for problems. Your primary care veterinarian provides professional services in a team effort with Dr. Kressin. This team can provide very basic services to virtually every service your family dentist offers for you, AND even more. Find a a variety of information about dog dentistry, cat dentistry, rabbit and rodent dentistry or find information from our VIN database.